Home - Believe Vacations | Dream It. Do It. Having a personal Disney Vacation Planner is a luxury you can afford—because it’s free! At Believe Vacations, we believe in magic We know first-hand the endless joy that Disney can inspire, and our vision is to help as many people as possible experience the magic of Disney. And the magic should begin the moment you decide to book your Disney vacation. With decades of experience, our Vacation Planners are well-versed in Disney’s countless magical experiences and have the expertise to help you create truly unforgettable memories for you and your family. Walt Disney World® Resort is the ultimate family vacation destination. This is where dreams come true in four theme parks, 23 impeccably themed resort hotels, two water parks, a dining and shopping district, four golf courses, two mini golf courses and a state-of-the-art sports complex. Around every turn you’ll find whimsy and wonder, fun and fantasy, magic and thrills, and every member of the family will find endless opportunities to shop, dine and play. A Walt Disney World® Resort vacation is the beginning of a lifetime of memories. Walt Disney’s original dream comes to life at Disneyland® Resort in Anaheim, California with two amazing theme parks –Disney California Adventure® Park featuring the 12-acre Cars Land® and the one-and-only original Disneyland® Park with its world-famous attractions and beloved Disney characters. Stay at the hotels of the Disneyland® Resort where an incredible vacation becomes an unforgettable storybook escape. First-class amenities offer more relaxed family time for making memories. Plus Downtown Disney® District, an eclectic entertainment, dining and shopping district is just steps from your hotel. Your family vacation is more magical than ever at the Disneyland® Resort! A combination of impeccable Disney service, entertainment, and nautical adventure awaits you on board Disney Cruise Line®. Disney has selected the most stunning destinations – in the most exciting regions around the world – for cruises you and your family will not soon forget. Enjoy the service and expertise of the dedicated crew as they guide you in your exploration of international ports of call, from the Caribbean to Alaska to Europe and beyond. Explore the world – and the Disney Difference. On an Adventures by Disney® trip you’re a traveler and an adventurer, not just another tourist. Your whole family becomes active participants in incredible stories, amazing experiences and cultures through immersive experiences led by your Adventure Guide. Adventures by Disney® currently offers 41 unforgettable travel experiences all around the world, magical trips only Disney can provide. Itineraries include special departures for multi-generational families and adults only. Aulani, a Disney Resort & Spa is a family paradise in Hawai’I with a touch of Disney magic, a place where everyone in the family can enjoy amazing adventures. There are special places for adults, teens and kids, as well as plenty of places to enjoy together as a family. Brush up, me hearties, yo-ho! Get your bearings straight with these maps of Disney parks and resorts. Click on any map to enlarge. Find something to celebrate! Perhaps your un-birthday? The first step in planning a trip to Walt Disney World® is to decide on your travel dates. What is the best time to go to Disney World? Well that depends. Crowd levels fluctuate throughout the year based on several factors including holidays, school breaks, and marathon weekends. We have created a crowd calendar and description for each month to help you determine the best time for you to visit the Happiest Place on Earth. The crowd calendars are based on historical data, theme park projections, personal experience, and Disney World seasonal pricing. Our passion is helping design personalized Disney vacations that will bring enjoyment to the young as well as the young at heart. We make your journey as magical as the destination. Avoid making reservations and focus on making memories. With decades of experience, we’re ready to share all that Disney has to offer. Your Believe Vacations Planner will help you make the most of it. You’ll quickly realize the advantages of using a Believe Vacations Planner—more free time and a totally free service are but two. 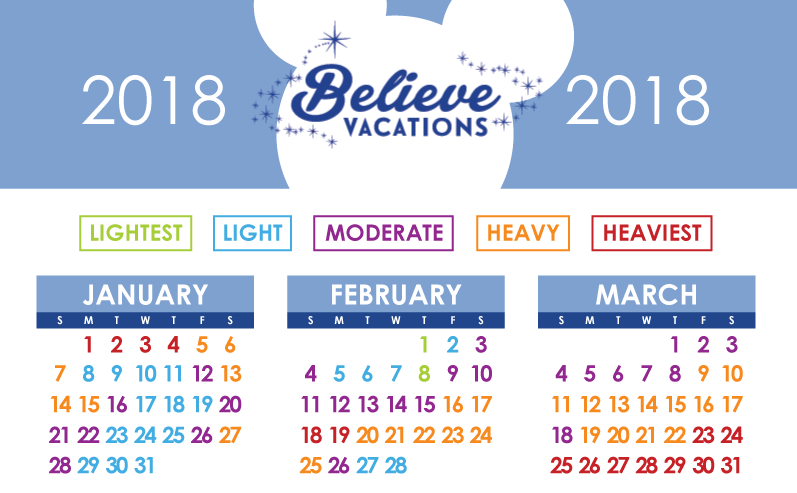 Each of our Believe Vacations Planners has extensive experience—having gleaned insight to share with you from trips to various Disney destinations throughout the decades. Here at Believe Vacations, our alma mater is the Disney College of Knowledge. Look no further for expertise in magical experiences! What separates Believe Vacations from others? Forget one-size-fits-all travel agency bundles—plan on us because we plan for you! We plan to make the most of out your magical experience. Our Believe Vacation Planners make personal connections to suggest plans that will help you make memories in a way that makes sense for you. After we get to know you, we can make recommendations about resorts and activities that fall within your price points. Even more, we can make your dining reservations in advance (up to 180 days in advance!) Spend your free time at ease instead of on hold chasing hard-to-find reservations. We’ve got you covered. After we make a plan, we can help you add-on the amenities that ensure you do Disney efficiently—helping you to make FastPass+ Selections that fit your personal itinerary we’ve planned together. Other planners may add fees into the cost of your trip. We do not. Our services are free to you! We’re tapped into a network of Disney deal-hunters on a mission to offer value in your vacation. If a promotion comes out after you book your vacation, our Believe Vacation Planners will help to apply the promotion to your package (if possible). We need some quick information about you. Or, you can call us at anytime (972) 974-7966 or email us: info@believevacations.com. Would you like to work with a specific Believe Vacations agent? No, I would be happy to work with any agent. Do you know when you'd like to travel? How old will each child be at time of travel? Any special occasions? Or, anything else you'd like to share? Got questions? We’re all ears. Start your Disney career today. We have a reputation for our impeccable services. We want to ensure that each team member at Believe Vacations is empowered to create truly unforgettable memories for our clients. To achieve this, it’s important for our Disney Vacation Planners to have the proper skills and expertise from traveling to the various Disney destinations. Send your resume or letter of interest to careers@believevacations.com.